Stuttgart, May 6th 2006:	With a distinct 69:7 win over Swiss team Winterthur Warriors, the Stuttgart Scorpions remain unbeaten in their first EFAF-Cup participation. The Scorpions running game again was successful with Chris Jackson and Tony Avella scoring. Especially German National RB Patrick Geiger seemed unstoppable, gaining 244y and five touchdowns with only 18 runs in front of 760 mostly enthusiastic viewers at GAZi-Stadium. Dominant on both sides of the ball, the Scorpions defense and special teams scored too, with LB Jasson Scott returning an interception of Warriors-QB Marlin McKinney, S Jeff Carpenter recovering a fumble in the Warriors end zone and DB Hassan Rashid returning the opening kickoff for the 2nd half 82y for a touchdown. The Warriors only score came midway through the 2nd quarter, when LB Patrick Moore forced a fumble by Stuttgart’s RB Marc Wiedmann and ran untouched 80 y for the guest’s honorary touchdown. 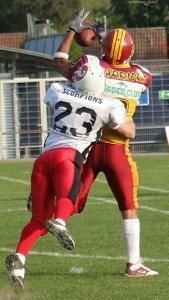 As it looks now for the quarterfinals, the Scorpions will get a rematch against the Hohenems Cineplexx Blue Devils on May 20th at Stuttgart. Stuttgart Scorpions- P. Fajfr 3-7-0-35; G. Michel 1-3-2-6. M. Mecherlein 1-31; S. Freiwald 1-0; J. Scott 1-25. Winterthur Warriors- T. Müller 2-1; J. Adamson 1-1; S. Koch 1-1. Stuttgart Scorpions- M. Wiedmann 1-1; G. Michel 1-0; C. Jackson 1-0. Stuttgart Scorpions- J. Scott 1-1; A. Mecherlein 0-1; D. Mirus 1-0. O. Metzger 0-2; M. Rendsburg 0-1; D. Koslowski 0-1.